Take the time to walk down Lincoln Street — to the corner of Lincoln and Main. Look to the north, and imagine: Instead of the slow moving cars that wind past Spokane Falls Boulevard toward Monroe, imagine four lanes, full of cars that speed along, just the way they do on Division/Ruby. The Lincoln Street Bridge will become a one-way heading north, and Monroe will become a one-way heading south. Imagine that thoroughfare, visualize the new traffic pattern, and ask yourself the obvious question: Have the members of the City Council who brought this bridge to life lost their marbles? Take the time to look over the computer-generated renderings of what the designers are calling the “Legacy Bridge” — what city officials are claiming will protect the view of the falls for decades to come. Then walk to the library and check out Orwell’s 1984 and read all about doublespeak. And while you’re walking to the library, ask yourself another question: When this version of Division/Ruby is up and running, will anyone be able to walk safely to the library again? Throughout this tangled debate over downtown, I have tried — seriously tried — to remain open-minded to the solutions that have been cooked up for downtown Spokane. I continue to give our officials the benefit of the doubt. Yes, they say the want to “save downtown,” and I believe them. I believe them when they say that we need the Cowles-Nordstrom project, and that we need the parking garage. Are we getting a good deal? Even a decent deal? I give them the benefit of the doubt, but my skepticism is starting to come through. It comes through loudest when I stand out on Lincoln, looking north. I consider all the lofty public pronouncements and imagine the consequences of a freeway through downtown. Who’s kidding who? It’s hard not to agree with the cynics, who say that our officials, their public pronouncements about creating a “special” place downtown to the contrary, just want to ensure that we create a mall atmosphere downtown (SouthTown? ), complete with easy access via wide, fast streets. This is what the cynics say, and this is what I don’t want to believe. I don’t want to believe that this is all about private aggrandizement. But then I remember the old saw about never ascribing to conspiracy something explainable by stupidity — that’s what I tell myself. Over and over again. And this one’s easy; it simply is the case that our elected officials don’t know how to ask questions that take the discussion beyond the logic and arguments made by the all-powerful traffic engineers. I tell myself that they simply never thought to have the proposal critiqued by the likes of a preservationist such as Donovon Rypkema, or an urban architect of the stature of a Daniel Solomon, or a nationally know urban critic such as James Kunstler. I try to remain convinced that they simply never thought to consult with those leaders in downtown Portland (where pedestrians are at the top of the list of priorities for any urban project). 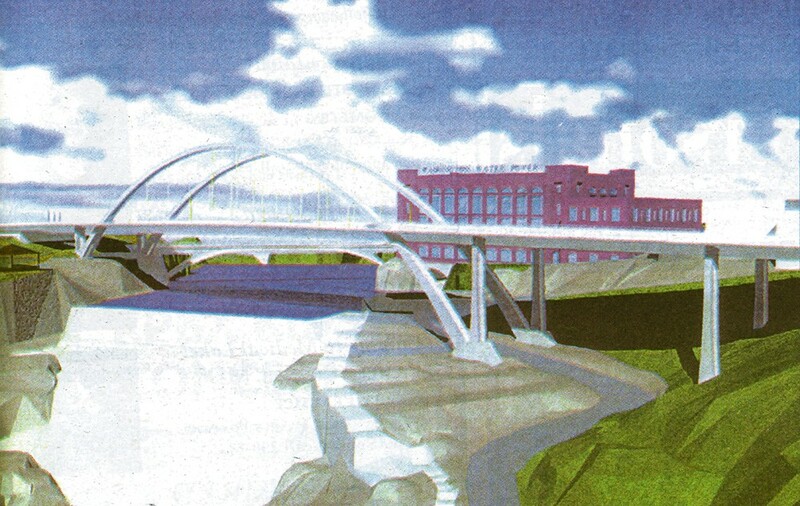 I think that any of the above critics would have reservations, at the very least, about such a project as the Lincoln Street Bridge and how it could change downtown Spokane. I try to believe that our elected leaders simply lack the know-how necessary to bring to bear the kind of criticism successful urban designers thrive on. Now we deal with inertia. The design’s been drawn, the money’s in the bank and the bureaucrats are counting the days. It’s a done deal, and there’s no way to change it. The scenario reminds me of another time, another place and another decision — another pivotal decision, the sort that the Spokane City Council faces. There are examples of inertia and the damage it can do throughout American history. A memorable one began early on the morning of July 3, 1863, when General James Longstreet peered out over an open field to a low ridge a mile away. Once again, one last time, he urged General Robert E. Lee not order his three divisions out across that field. But Lee wouldn’t reconsider; it was a done deal. The Army of Northern Virginia had fought for two days and achieved its objective. Lee would not leave things that way. He was propelled by inertia, and, perhaps, by more than a small amount of stubborn ego. Later that afternoon, at 3 pm, General George Edward Pickett carried out Lee’s order and his three divisions enter the history books — but not in the way they had hoped. Rather than turn the tide of the Civil War for the South, they were routed. The decision to send them to fight at Cemetery Ridge outside Gettysburg has gone down as the Civil War’s turning point. Just as Pickett’s Charge has gone down as an example of how the best intentions aren’t always enough, so too will the Lincoln Street Bridge enter our history books. Here, the historians will write, is where Spokane bought the farm. Once this damnable eyesore went up and the cars began to speed through, the downtown never recovered. Unless, of course, the cynics have been right all along, and it’s all according to plan. Then our historians will write something else. Either way, the results for downtown Spokane will be the same. Rest assured, the damage caused by an overpriced parking garage, even when combined with what could turn out to be a badly designed commercial project, will pale compared to the damage to urban life that will result if this monument to the automobile is built. Division/Ruby West. That’s what we will have done to our downtown. Go stand down on Lincoln, look to the north, and remember General Longstreet’s advice. This is no drill. This is not melodrama. It’s about 2 pm in our civic afternoon. And 3 pm, the time to charge into the future, is only a few minutes away. Are we, too, being overwhelmed by inertia?